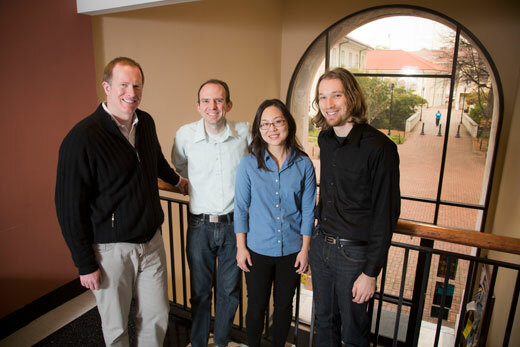 Marc Bousquet, Brian Croxall, Erin Suzuki, and Nathan Suhr-Sytsma (from left to right) are among a wave of new talent that has joined Emory's English Department this semester. Emory Photo/Video. When Emory freshman Posi Omiwade enrolled in a course entitled "Literature and Technology" this fall through the English Department, he wasn't sure what to expect. But with plans to major in neuroscience, he was curious to consider the intersection between literature and science. And he wasn't disappointed. What the freshman found in the classroom "blew me away," he says. From exploring cyberpunk literature and blogging book reviews to reading a retelling of the classic "Frankenstein" story on an interactive iPad app, Omiwade was riveted. "I was shocked and surprised at first that we would incorporate these things into a literature class setting," says Omiwade, from Dallas, Texas. "But I was so happy about the books we got to read… and I personally enjoyed the class. It made me look at life and technology from a different, literary perspective." Welcome to 21st century literary studies, a changing landscape that opens the door to fresh perspectives for exploring writing and literature, stretching the possibilities for new directions of scholarship and capturing student attention. Nowhere is that more evident than Emory's English Department, where coursework has been strengthened by an infusion of new talent hired this year — eight faculty members offering a rich diversity of backgrounds and expertise. Marc Bousquet, acting associate professor of English and director of college writing. A leader in the academic labor movement, his interests include digital pedagogy, writing studies and participatory culture. Jericho Brown, assistant professor of English and creative writing. His award-winning poems have appeared in numerous journals and anthologies; his first book of poems, "Please," won the American Book Award. Brian Croxall, lecturer in English and digital humanities strategist. His research explores representations of technology within fiction and philosophy, especially in connection with psychological trauma. He also writes about integrating digital tools within teaching and led this semester's "Literature and Technology" class. Abdul JanMohamed, Augustus Baldwin Longstreet Professor of English and African American Studies. A groundbreaking figure in African and South Asian postcolonial literatures and cultures, his work also examines 20th century African American fiction. Heather Julien, senior lecturer in English. Her research includes life writing and new media, British women writers, and Jewish literature. Erwin Rosinberg, lecturer in English. He specializes in modern British literature with an emphasis in studies of the novel. Nathan Suhr-Sytsma, assistant professor of English. His research focuses upon 20th and 21st century poetry and postcolonial literary studies, with an emphasis in texts from Anglophone Africa, Britain and Ireland. Erin Suzuki, assistant professor of English. Her research examines indigenous, immigrant and colonial literature from around the Pacific. "We had a windfall year in terms of success in recruitment," acknowledges Walter Kalaidjian, professor and chair of the English Department. The strategy, he explains, has been to build upon existing strengths while expanding in important directions: a push toward interdisciplinary scholarship that offers greater global dimension, writing in digital environments, and a renewed emphasis on a writing-intensive undergraduate experience. That may include "expanding the whole definition of writing into creative nonfiction and digital formats," even creating for students what has been described as a "domain of one's own" — a pilot project that would provide individual Internet domains for students to showcase writing portfolios or promote scholarly work. On the horizon also are plans to hire a director of freshman writing and to explore partnerships between the Emory Writing Center — where students can work one-on-one with tutors to revise and edit their work — with the Woodruff Library's Digital Scholarship Commons (DiSC) "providing students with a more multi-modal set of writing resources," Kalaidjian explains. "This is, perhaps, a very unique moment for the department," he adds. "We plan to provide a model of what an expanded English department will look like moving forward into the 21st century." Marc Bousquet arrived at Emory in late July to teach graduate classes. But as director of college writing, he also sees a bigger picture. "My job is to think strategically about writing within the curriculum in Emory College of Arts and Sciences," he says. "How does our understanding of academic and professional writing change in the context of social media, digital tools and global linguistic change?" For English departments across the country, these are indeed interesting times, Bousquet says. A supporter of the "domain of one's own" concept, Bousquet would like to see college exposition move away from "thesis-driven patch writing, the kind you get when students look at the database as a jewelry store window and perform this smash and grab, ‘I want this phrase, that phrase.'" "We're all tired of that," he says, adding that Croxall's work with digital humanities at DiSC "is furthering the cause in rethinking the way we do our writing and research, and also helps us reimagine what we ask our students to do." Why try this at Emory? "For me, personally, it's a tremendous opportunity to get in on the ground floor investment in a new program, an opportunity to be part of a department willing to reimagine itself, thinking 20 years down the road," he says. "It's a really exciting time to be here." For Abdul JanMohamed, Emory's "strong potential for African American literary and cultural studies" was the draw. He's been delighted to find "a wonderful cluster of hires in postcolonial and Asian American discourse that brings together a nice, coherent focus." Along with new hire Erin Suzuki — and her work on Asian diaspora and Pacific island literature — the department expects to host a series of symposia and speakers this spring around Anglophone literature, works written in English outside of the United States and Great Britain. "One of the things that is so exciting to me, especially when I learned about other new hires within the department, was that it seemed (the English Department) was interested in exploring a more transnational perspective on English literature," Suzuki says. "I always assumed that I'd have to tone down a bit," she adds, laughing. "But I was very happy that they wanted me to explore these linkages, to be given the latitude to work with other departments, not bound by disciplinary categories in teaching, research and dialogue." Her overall impression? "The University seems to be in this exciting building stage, with a radical openness to new ideas," she adds. "Obviously, the program is already strong. But there is a sense the department is building on its strengths. It's nice to think when you're hired that you'll be shaping that character." Last year, USA Today named Emory as the nation's top college for aspiring writers, citing small class sizes, extraordinary flexibility for students — English majors can concentrate on either literature or creative writing — and "a plethora of outstanding minds." Add to that outstanding writing talents, from acclaimed poets Natasha Trethewey and Kevin Young to novelist Joseph Skibell and University Distinguished Professor Salman Rushdie. These were the kinds of writers that attracted award-winning poet Jericho Brown, a Louisiana native — he was once a speechwriter for the mayor of New Orleans — who is thrilled to return to his Southern roots to teach poetry and creative writing. "Working with poets like Natasha and Kevin is really an honor for me because they've always been role models," says Brown, who advocates acceptance of all poetic genre, from spoken-word and slam poetry to hip hop and rap music. "I'm interested in the fact that so many people are taking writing seriously," he adds. "The more people who understand that the written and spoken word shapes so much of what we do, that writing and literature have the capability of changing minds and lives, the better." Consider Ali Soloff a convert. The Emory freshman came to Croxall's "Literature and Technology" class this fall as "more of a math person — it's not like I was passionate about English," she admits. But at the end of the semester, she looks back upon the course as "definitely my hardest class, but definitely my most satisfying," Soloff says. "It was a lot of work, but the most meaningful (class) that I've taken at Emory. I just feel I can analyze, focus and summarize a lot better. My writing really improved." Despite new people and perspectives, Kalaidjian believes one of the English department's most valuable resources remains its students — talented, motivated and hungry for a robust liberal arts curriculum. "In his recent State of the University address, President Wagner underscored the strength of the English Department, and also the University's continuing commitment to maintaining Emory as a leader in the liberal arts," Kalaidjian says. "In fact, he's been very supportive of things like the Ellmann Lecture series, our MARBL (Manuscript, Archives and Rare Books Library) collections, our Irish collections — I would say it's reflective of the priority Emory sets on the humanities, English and the study of writing at all levels."